They've never been seen in the same room together. They clearly share a high percentage of the same genes. Meet the people who have been... quite literally... born twice. The media is strangely silent about the fact that the newly announced Archbishop of Canterbury is twinned with a character from the world of fiction. One of them is a strange, goblin-like creature, living underground and obsessively searching for an ancient ring of power, while the other is Gollum from Tolkien's Lord of the Rings. 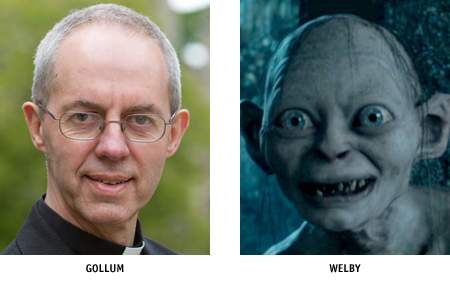 Justin Welby is reported to be at Lambeth Palace tonight, searching, he told reporters, for "my precioussss".